This highly acclaimed volume contains thirty essays by such leading literary critics as A.O. Lovejoy, Lionel Trilling, C.S. Lewis, F.R. Leavis, Northrop Frye, Harold Bloom, Geoffrey Hartman, Jonathan Wordsworth, and Jack Stillinger. 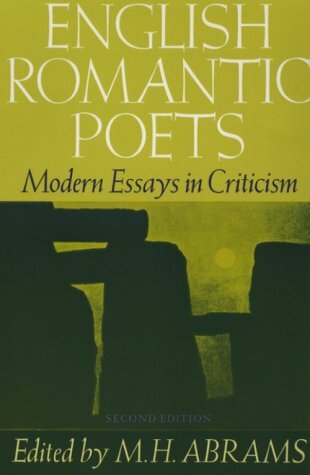 Covering the major poems by each of the important Romantic poets, the contributors present many significant perspectives in modern criticism--old and new, discursive and explicative, mimetic and rhetorical, literal and mythical, archetypal and phenomenological, pro and con. as author of a popular Glossary of Literary Terms, and several influential essays on English Romanticism. Abrams's dissertation written in 1940, was expanded and published in 1953 as The Mirror and the Lamp: Romantic Theory and the Critical Tradition. The Mirror and the Lamp contributed to the legitimation of English Romanticism as a field of study. Nearly 20 years later, in Natural Supernaturalism, Abrams asserted a different thesis with similar authority.